The U.S. Army, along with U.S. Sen. Mark Warner's office, recognized a soldier's heroic actions from his service in World War II. However, the Silver Star, the military's third highest combat award, was pinned to 95-year-old Lt. Col. (Ret.) Ralph Kuethe 70 years late Friday. "Well the main thing [is] that I lived this long to receive it," Kuethe said with a chuckle. The former soldier's heroic actions date back to Sept. 22, 1944. As Allied forces withdrew all around him, Kuethe got orders to hold the line. He organized a plan that ultimately pushed German forces into retreat. "We stopped the counter attack and setup a defense at that point," he said. But Kuethe was never recognized for those daring actions. In fact, the Silver Star for that heroism was awarded to someone else. "... The person who received the Silver Star in my place... seven days later, [they] had changed the citation officially to a different action on a different date," Kuethe said, "and essentially vacated the approved Silver Star." 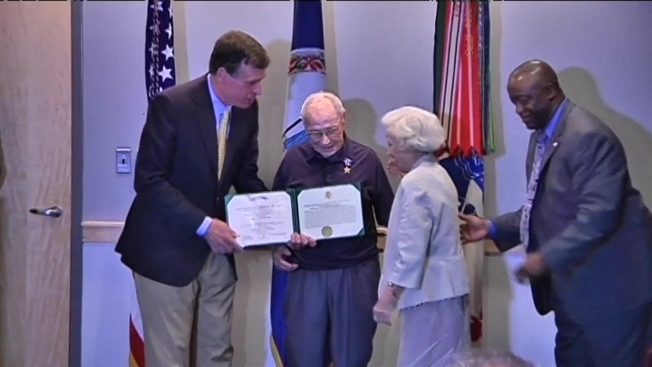 Sen. Warner's office helped facilitate the honor to bestowed on its rightful recipient. "70 years ago the Army awarded the medal to the wrong guy and it's taken this time to rectify," said Warner (D-Va.). Alongside Kuethe was his wife of 69 years, Dorothy. The two met as he was recovering from war wounds. He hasn't slowed down much. "I did 40 sit-ups this morning. The last 15 I held for a count of five each," Kuethe said of his daily routine. When asked what he had planned for the rest of the day, Dorothy chimed in, saying, "Watch 'Gunsmoke!'" "Well, I do watch 'Gunsmoke' at night," he said. "And of course Channel 4 news."